***** HOLIDAY DISCOUNT FOR A LIMITED TIME!!! Gmail Contents Exporter is used to backup contacts, emails, calendar and tasks from your Gmail account. With this handy tool, you can export Gmail contacts, the important emails or other items to save on your Mac on-the-go. Now, don’t need to worry about missing your contacts, significant mails, or tasks any more. - Support to backup all Gmail contacts, emails, calendar and tasks in your Gmail account. 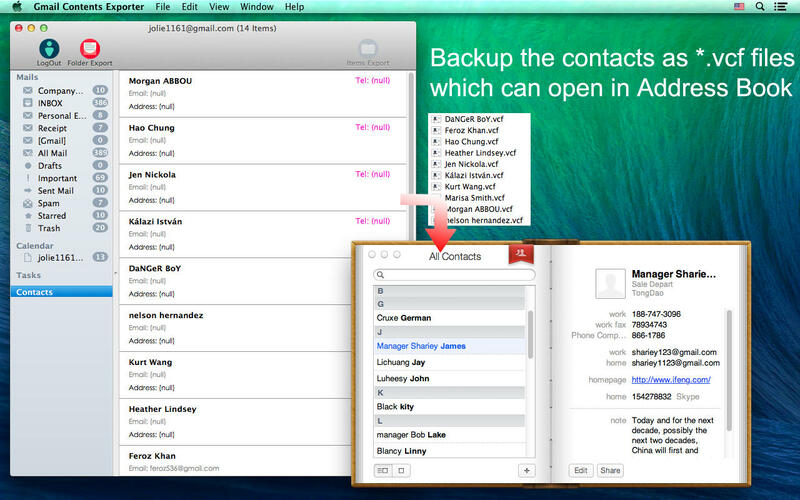 - Backup the contacts in your Mac as *.vcf files which you can open directly in Address Book or sync to it..
- Export the emails to *.eml format which can be opened in clients like Apple Mail. - Save the calendar and tasks to iCalendar (*.ics) files and sync into Apple Calendar, manage your tasks anytime anywhere. - Super easy to use: sign in your Gmail account and select the items to export into your Mac for backup. - You can select some needed items for backup, or choose the whole folder to export. - Copy all the items to save on the local discs with no quality loss. - Responsive app with fast running speed. - 100% safe. No any of your personal privacy leaked out. * To get access to your Gmail account, you should accept the respective terms of service and privacy policies. * To open the exported .eml files at the first time, you need to type in your Gmail account. * Change the app name. * Other minor optimizations and bug fixes.